I love ally our pretty things! That bush sounds like a fun one - even with thorns! Those little flowers are so sweet - can't wait to see the finished product! How sweet she is. I'm glad you've had a good Easter. It's been like summer here as well, on and off. Your little man sounds wonderful, so kind to his sister. Here it is every boy for himself most of the time I'm afraid. Do you have any tips?! I love the start of the blanket. I've been contemplating a crochet blanket. I've got some wool, but I just can't seem to settle on what to do with it. Ripple? Granny? Or maybe knit? Decisions, decisions. I agree that this year has gone ridiculously fast. It's scaring me how quickly. In September my biggest boy will be in his last year of little school. I can't bear to think about the year after. Pretty things, indeed! From flowers on porcelain, plates and petaled blankets, all adorable! All very lovely things...and it's even better when they come at bargain prices. Great finds! Jennifer, you know what I love about you? You're so real and honest and natural and good. I loved this post, and all of them really. I'm taking that book I got after seeing it on your blog.. to the beach so I can read it. I have one vintage bed sheet in a very similar pattern, it's for a single bes and it's in very good condition. I wonder if it is worth anything? Beautiful photos as always. I had fond memories of the little collections I used to put together at that age - it sounds like your daughter is inheriting a very creative, craftsy mind from you! I love reading all about your adventures in life and this is a lovely post as always. Sounds like a happy & blessed Easter holiday was had by all. 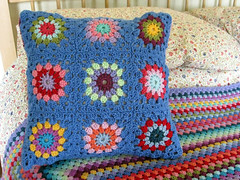 Your crocheted blankie & the decorating in GB's room is going to be just perfect - fantasy decorating is fun, don't you think? I know you'll make it happen exactly when it's meant to be. And I love the little collection of things in her bicycle basket too - what an interesting and imaginative little bear you are raising, well done! What a lovely Easter round up, so many lovely things and so many lovely thoughts. Very pretty post from those beautiful flowers to that adorable china. My particular favourite was the vintage pillow cases, I just loved the colours and pattern. Jennifer, that is a lovely post. Thank you for sharing your sweet things. I guess this post is one of "the things I just like!" You had a lovely Easter! We had gorgeous weather too, totally unexpected! Your iris photo is stunning, and I enjoy seeing the progress on your colorful little circles. And then there's the chickens! They look so happy. You have such a peaceful and happy life. I think they sense that and will become prolific layers because of it! How sweet is the GB?! I love the things she collected. Lovely post, as always. The pillowcase and skirt are great finds too. 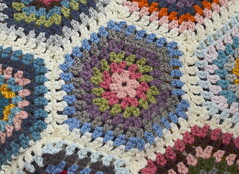 Your crochet circles are gorgeous, such lovely colours, they will make a beautiful blanket. I always wanted a basket on the front of my bike when I was a child but I never got one, awwww. I'm glad you had such a nice Easter, Jennifer. It's funny, but when I looked at the picture of the box of crayons I could "smell" them. I guess that memory has been firmly planted by my own childhood, followed by all the years when my kids had crayons. And cornflower blue is my favourite colour too! what a wonderful weekend. great finds at the thrift store! That's a post full of loveliness. Olly's man bag is usually full of bits and bobs he's collected. This holiday he has filled it with shells and and bits of wood from the beach. Your blanket is going to look beautiful. I envy you your girly bedding plans very much. I love this post, so full of wonderful things to savor. Memories made. Hugs to you and by the way I think you are ubber cool, jeans and t-shirts and all. I love your fantasy decorating Jennifer - most things begin with a dream . . . . Your GB is so sweet, no wonder you're so proud of her! 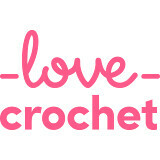 I'm loving your crochet and all your goodies, especially Betty hen - I'm with you on that one, definitely, and the new crayons are such gorgeous colours and so exciting for youngsters (as well as oldies) to be gifted new colouring equipment! That is one nice big brother, so many lovely moment from your Easter week. What a lovely Easter you all had! Your new skirt is so fun and colorful... great find! That iris is indeed beautiful. And I'm so envious of those new crayons. I suffered crayon envy the other day when a friend pulled a brand new box from her bag... I vowed to replace our blunt and broken ones at the first opportunity! Just catching up with you :) The iris and your photograph of it are gorgeous! And I love the skirt and the story you've attached ... me too! Can you believe my Mum didn't like us having the Crayola crayons, we always had pencil crayons instead ... I think I missed something, looking at that box of delights! I loved this post Jennifer and so many pretty things. The photo of the Iris is stunning and I think your skirt is gorgeous. Glad your Easter was such fun for you all. I'll let you in on a little secret...I have a box of the 64 crayons, too! I haven't even used them yet, but I love opening the box and smelling the crayons. ;-) And one of my favorite colors is the Cornflower Blue, also. And your skirt...I bought an almost identical one at a thrift store yesterday! I was so disappointed when I got home and tried it on and found it's way too long. It actually drags on the floor. I will pass it on to a friend who's a couple of inches taller than me. I love the 70's pillowcases you found - the colors and pattern are awesome! Splendidly beautiful photos of life's simple, amazing pleasures (of which, I totally agree, few tops a classic box of crayons - that smell is so lovely and evocative of childhood).